Combine sauces, lime juice and rind in a jug and mix well. Heat ½ tablespoon on a non-stick large frying pan over a medium heat, Cook chicken for 2-3 minutes until golden. Remove from a pan and transfer to a plate. Meanwhile, prepare noodles according to packet instructions. Heat remaining oil in frying pan. Add snow peas, broccolini, spring onions, and sugar snap peas, and stir-fry for 1 minute. Add chicken and sauce and cook for a further 2 minutes. Stir in drained noodles and stir fry until heated through. 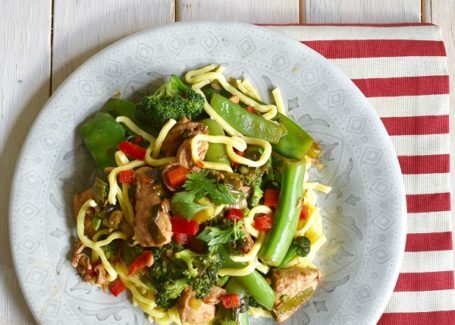 Divide noodles, chicken and vegetables evenly between serving bowls and serve.